World’s leading premium business app discovery platform, GetApp, released its quarterly ranking report for Q2, 2016 and CakeHR has every reason to rejoice. Drumrolls Please! 🙂 We featured among the top 10 HR Software Solutions, securing a credible 6th spot on the list, thanks to our loyal and happy customers! 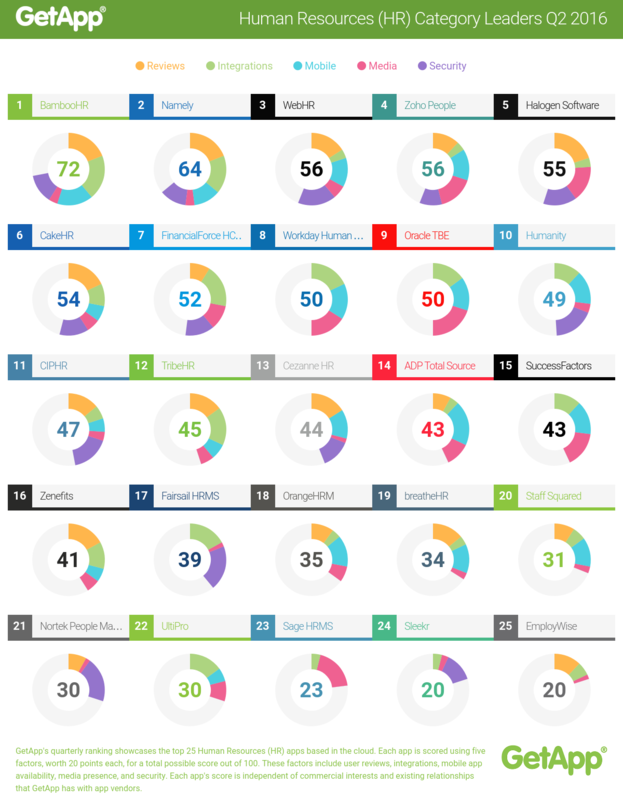 The ranking report showcases the top 25 Human Resources (HR) apps based in the cloud, where each of the featured app is scored using five factors, worth 20 points each, for a total possible score out of 100. CakeHR stands above the average with a score of 54, surpassing the industry bigwigs like ADP and Oracle, which in itself is a huge achievement. This ranking is for business owners and decision makers looking for a first glance at the leading cloud-based Human Resources (HR) software in the industry. The data serves as a point of reference highlighting the key factors that small and mid-sized businesses should look at when first analyzing a piece of software. GetApp is a part of the prestigious Gartner group, and employs rigorous and non-biased methodology to arrive at the scores. What makes the GetRank results trustworthy is the fact that each score is completely independent of commercial interests and existing relationships that GetApp may have with app vendors. What you see is what you get, and that is – “A true reflective and comparative picture of leading apps”. Our journey towards technological excellence cannot be complete without recognizing the trust our amazing clients place on our software. Support on social media, helpful referrals and awesome ratings/reviews have facilitated our exponential growth in the cloud app market. And we are not going to stop here! Serving clients in more than 1000 cities and 90 countries, we are highly positive to make our presence wider and stronger. Our team at CakeHR will continue to bring exciting features and services to make your experience of using SaaS based HR Software unmatched and unsurpassable. On this note, we would like to highlight some of our most memorable client testimonials. Make HR challenges a thing of past by trying out our all-in-one HR app that will make your workplace effective and efficient. We look forward to you joining our enthusiastic and ever evolving CakeHR community on Facebook and Twitter. Your love and faith keeps us going! Want to know how you can benefit from our software? Get in touch with one of our CakeHR experts and introduce yourself to the power of affordable cloud HR.